Double-sided cardstock is very versatile for your scrapbooking projects. Knowing how to use double-sided cardstock can give you extra options for your scrapbooking projects. Double-sided cardstock is scrapbooking paper with a solid color or pattern on one side and a different solid color or a second complementary pattern on the other side. Most double-sided cardstock is available in the 12x12 size, although a few companies do make 8 ½ x 11 double-sided paper. It's a frugal option for the scrapbooker on a tight budget. Essentially, double-sided cardstock gives you two sheets of paper for the price of one. It's convenient. If you have trouble finding supplies that coordinate for your scrapbooking projects, double-sided cardstock makes it much easier to design your layout. It cuts down on waste. Having two options for your paper makes it easier to avoid ending up with too many scraps after you're done with your project. Double-sided cardstock is usually thicker than ordinary patterned paper, which can be a significant asset if you need extra support for heavy embellishments. If you don't plan to use brads, eyelets, or heavy embellishments, cut down on bulk in your album by creating one complete layout on each side of the paper. This tactic works very well for theme albums when you're using the same product line throughout the book. 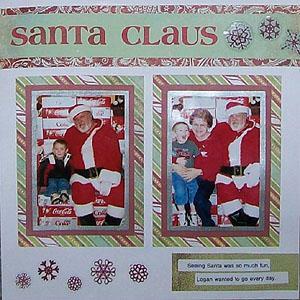 Tear a strip of your double-sided paper to use as a simple page border, then use the reverse color or pattern to mat your photos on a second sheet of cardstock or patterned paper. When you're making a layout that includes multiple photos, create space for hidden journaling by using your double-sided cardstock to add a flap to your layout. Can't decide what to do with the index prints you receive from your photo developer? Use a sheet of double-sided paper to create a small folded mini-album that can be attached to your layout to add extra space for these tiny prints. Cloverbud Connections has a simple tutorial that explains how to fold your paper to create a mini album. Add interest to a plain photo mat or journaling block by folding up one corner to reveal a hint of the secondary color or pattern. Make a pretty dimensional floral embellishment for your page by punching out several flowers from your paper and layering them with opposite sides showing. Although double-sided cardstock is certainly handy for scrapbooking, it's especially versatile when you're making handmade greeting cards. When you make a card from ordinary patterned scrapbook paper, you're stuck with a plain white interior. When you cut and fold a card made from double-sided paper, however, you'll have a pattern on the outside and a pretty coordinating solid on the inside. Card making is a wonderful complementary craft for the avid scrapbooker. Making cards gives you a chance to use your leftover supplies while practicing new techniques. If you plan your cuts carefully, you can even create a scrapbook layout and a handmade card from the same sheet of paper. For card making tips, tricks, and sample projects, visit LoveToKnow Crafts.